Recently Kedaar started showing interest in writing and drawing. By the time we go to pick him up from school every day, he will be sitting with 3,4 kids at his table and seriously will be drawing something. His favorite objects for drawing are volcano, mount rainier, face, train :) He is also able to write some letters (he used to write 1,2 letters before but now he seems genuinely interested), 1-6 numbers. He is also tracing with his fingers while he is reading small words. Its fun watching him to be getting into this new interest so naturally. Here are some pictures of his recent work in school. Kedaar has friend in class by name 'Atharva'. He is a five yr old and one of the few 5ys old kids in class (class has 3-5 yr olds) and helps the assistant teacher in some of the acts like keeping the students in line when going out, taking the smaller kids to rest rooms etc. From the day 1 of his school, Kedaar started treating Atharva as his role model, best friend. At home, we have to hear Atharva's name atleast once the evening after he comes from school before he sleeps. Some funny things I remember related to Atharva in Kedaar's conversations..
[Mummy]Kedaar, can you tell me the names of the kids in your class? [Kedaar]Atharva, Ali,Rakesh, Kareena, Atharva,Shreya,Shivani, Atharva..
[Mummy]Count how many kids are there with your fingers. [Kedaar starts counting] Atharva, Ali, Rakesh, Atharva .. (same story as above, all of a sudden during counting, he shows his middle finger and says] Mummy, this is Atharva, he is a 5 yr old big boy, the little finger is Shreya, she is only 2 yrs old. [Mummy]What is the scratch in your palm Kedaar, how did you get hurt? [Mummy]Why did you run fast, I told you to go slow? [Kedaar]but, but, but, Atharva was going like this..
[Kedaar reluctantly gets into car, mummy wanted to give company to Kedaar, so she sits in backseat] mummy, I am 5 yrs old ..
[Kedaar]But I am 3 and quarter, I will turn 5 tomorrow, when I am 5 yrs old then I dont need to sit in car seat. I can sit just like you. Atharva doesnt sit in car seat. [Kedaar]yeeaah, Mummy's name is Neeraja, Atharva's sisters name is Neeraja. 2 Neerajas, one small like this, one biiig. Kedaar surprises with some interesting statements once in a while. We watched "Leader" movie by Sekhar Kammula this weekend. We have been hearing to the songs from the movie from several weeks now and finally got to watch it. Kedaar loooves several songs in this movie and he can sing atleast few sentences of each of them. One of the songs in the movie is "vande maatharam". Kedaar was singing that in car today as "Bande maakaram" but with the same tune. We could adjust with "bande" as the bengali version of "vande" :) , but I had to correct him saying that the other word is not "maaKaram", but "maaTharam". He sang it as "maaDaram", then again "maaKaram" , again "maaDaram" several times and finally got to "maaTharam". In the process, he corrected "Bande" also and sang a good "vande maatharam". Seeing the smile on my face he started happy smiles "mummy, see, I am learning, see, vande maatharam". It was very cute. I noticed this few other times as well, he really tries hard to do right things if he thinks that it will make us happy and he tells us to be little tolerant while "he is learning". I think he is a mature kid and at every such instance we just keep reminding to ourselves that he is a baby and we should learn to be patient not with trivial things like songs, but any mischivious acts he does. Anyway, I and Chandra didnt have any clue on what valentines are. We did some research and went to Target just to find out that they have special aisles for these and all we had to do is just choose. Life is simple. We never knew it since 6 yrs because we never needed it. Kedaar picked the disney valentines and 2 nice greeting cards for his teachers Ms Indu, Ms Ginger. The day before valentines day, we did prepare the cards by writing names on them, sticking hearts to the cards. kedaar did a lot of work specifically he chose which card he wants to give for which kid, sat in daddy's lap and helped to write the names. He also traced the teachers name, his name in the cards he gave to teacher.It was fun and kedaar enjoyed it a lot. Kedaar was a super happy kid after he came back from school that day as he got a bag full of valentines from the other kids, some candy and fun stuff. Kedaar started going for soccer classes in Arena sports since 2 weeks. He was little shy in the first class for few mins and then started playing nice. This weekend, it was his second class and he had a lot of fun. 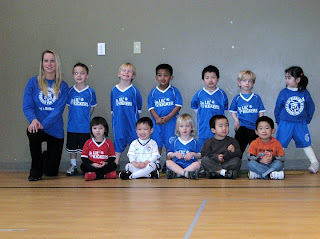 Here are some pictures, video of his soccer team/game. After we came back from India, the only albumn we started hearing is "Paa". Kedaar likes listening to all the songs in the movie, specifically "Gum sum gum" and "Hitchki Hitchki" songs are his favorites. He hums both of them very nicely. Around 2 weeks back, we went to the telugu movie called "Namo Venaktesa" in theatre. For the first time, Kedaar sat and watched the entire movie. He liked those songs as well as they have some kind of beat, especially "Namo namo venkatesa" song. he remembers it as the "Deva" song. Last weekend , we also saw the "3 idiots" movie and from then onwards "All is well" joined his list of favorites. I like watching him develop some interest in music and really enjoying it. Kedaar's school as some piano classes for 3 yr and older kids. We might actually join him there soon. Last week we took Kedaar to a small train adventure in the Seattle Link rail from Seattle to SEATAC airport for a round trip. Kedaar really felt this as an adventure and enjoyed it thoroughly. A new addition to Kedaar's train family. Kedaar got a surprise gift from mummy , daddy one fine weekend. Kedaar spends hours when we go to toy shops just playing with the train tables they have there. We have several sets of tracks, bridges as indepdnedent pieces, but train table as a whole has been still a missing piece in kedaar's view so far. Anyway, he loves the train table so much and spends a lot of time there. Luckily the table is compatible with Thomas trains as well, so he can play with all his 80+ trains in there.